Vice President Mike Pence swore in Robert Wilkie as secretary of Veterans Affairs on Monday. Wilkie served as acting secretary at the Department of Veterans Affairs after former secretary David Shulkin resigned in March and Trump's previous nominee, his physician Ronny Jackson, withdrew himself from consideration. "Since day one my administration has been focused on serving the men and women who make freedom possible, our great veterans, these heroes deserve on the best and they will have it under Robert Wilkie - I have no doubt about it," President Donald Trump said during the ceremony. Before Trump nominated Wilkie for the position at Veterans Affairs he worked for the Department of Defense as under secretary of defense for personnel and readiness. 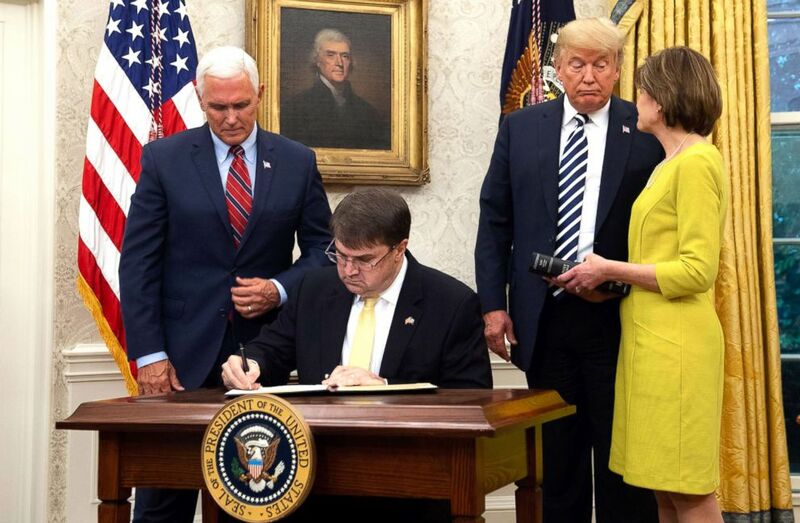 Robert Wilkie signs his commission after being sworn-in as Secretary of Veterans Affairs alongside President Donald Trump, Wilkie's wife Julia and Vice President Mike Pence in the Oval Office of the White House, July 30, 2018.